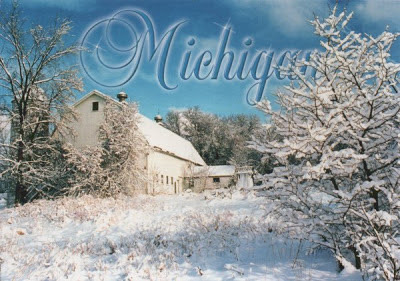 Our snow has gone but this postcard from Michigan brings back memories of how beautiful it looks when it's newly fallen. The sender tells me that the state was "founded" on farms and barns but that unfortunately they are being destroyed to make way for houses and similar buildings. Many people are doing their best, though, to try to preserve what they can. and you seldom see many of them when you travel anymore.